The Arnold Elementary School is shown on both the Martinet map of 1860 and the Hopkins Atlas of 1878. It is said that Thomas H. Arnold donated the land for the school. The building and grounds were located at the intersection of Baltimore and Annapolis Boulevard and Church Road. We have no idea what the first school looked like. We do know what the Arnold School looked like in 1912 from a photo contributed by Mrs. Mildred C. Schoch. water for dyeing Easter eggs; later we also had soup on cold days. Our teacher was Mrs. Frank Rice, Sarah Robinson Rice, who was “Miss Sadie” to all. She was organist for our church and so we benefited from her talents at school and at church when she put on entertainments for Children’s Day and Christmas. Mrs. Schoch also remembers all shared in the care of the school. The big boys brought in the wood from the shed in the rear of the building, and the students took turns getting water for the communal water bucket from the nearby Arnold farm. The desks were the “double type,” with the ones in front being slightly smaller than those in the rear. The desks faced the front of the room and the teacher’s desk was on a raised platform. hot lunches to bring back to the rooms to eat. But wait . . . there were two Arnold Elementary Schools. There was one for white children, and one for Afro-American children. 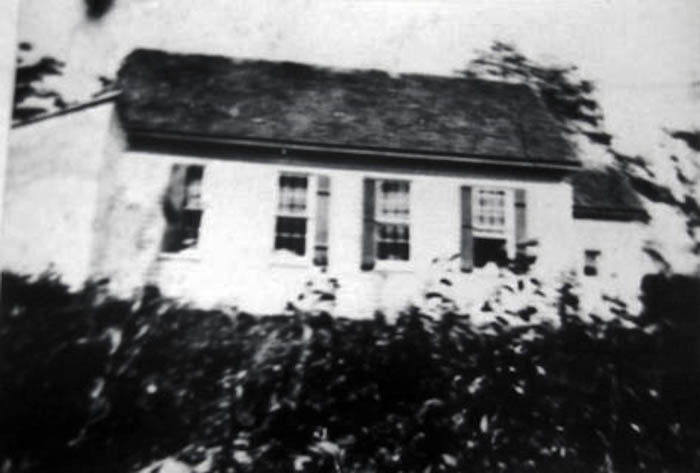 The other Arnold Elementary School was built behind Mount Calvary Methodist Church on Jones Station Road. 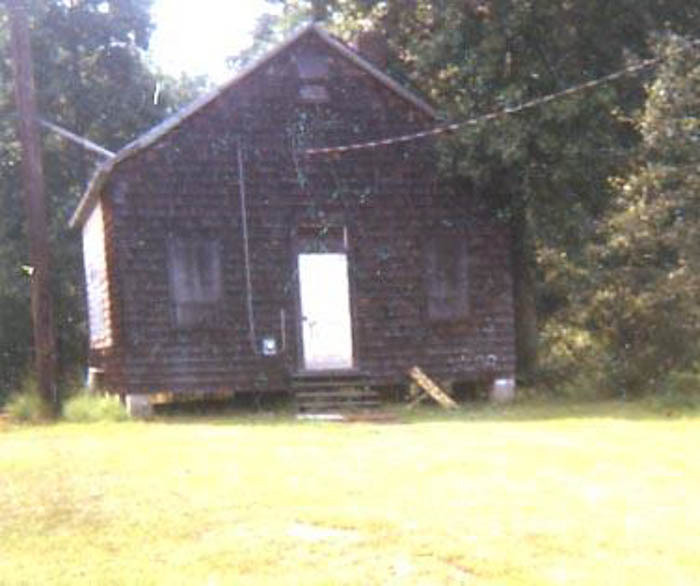 This building also could be described as a brown shingled structure with an asphalt roof and wooden floors ; but, as the photographs indicate, that’s where the likeness ends. Water had to be carried from the neighbors, and there was no basement. Two former students of Arnold’s Afro-American Elementary School share their memories. Aunt Connie (Constance Pulley Lamberth) attended the school from 1928 – 1934. The school had one room and one teacher. Aunt Connie walked to school from her home in the Shore Acres area, carrying a brought-from-home lunch to eat at her desk. She remembers that the teacher would move from age group to age group, while the other students went about their work quietly. Miss Alverta Darden also attended the Jones Station Road Arnold Elementary School in the late 1940s and early 1950s. There was still one room and one teacher, a chalkboard, and some books. She remembers how, in snowy weather, her father would drive the neighboring children from Church Road to school on a crude horse-drawn sled with a bale of hay on it. In the early 1950s, the Jones Station Road Arnold School was closed, and the student body was transferred to the Skidmore School on Colburt Road. By September, 1953, the Church Road Arnold Elementary planned to put in new ceilings, floors, lighting system, a drain field, new furniture, and a new serving area to replace the cafeteria. Eugene E. Gilhooly came to Arnold Elementary School as a teacher and principal in 1954. He describes the Arnold position as a proving ground for new principals. He taught 6th grade as well as administering school activities from his tiny office next door to the classroom. He fondly remembers those idyllic years when students were so responsible and disciplined. Each student was given a turn to answer the telephone if Mr. Gilhooly was teaching. There was no law against corporal punishment; but, when a discipline matter arose, he would call the parents and let them choose between a paddling or a few days out of school for the offender. Mrs. White brought hot lunches prepared at Belvedere Elementary School and, with the 6th grade helpers, served them to students at Arnold. A terrible tragedy occurred when Mr. Gilhooly was principal. He remembers being outside putting up the flag, when he heard the sound of an auto crash at the Arnold intersection. He immediately ran down to find a car with students being driven from Winchester-on-Severn involved in the crash. Two of his second grade students were killed. Later, for some reason, the life insurance checks came to the school. Mr. Gilhooly said delivering those checks to the parents was the hardest thing he ever had to do in his life. In the early 1960s schools in Anne Arundel County were desegregated. The community of Arnold was growing by leaps and bounds. The PTA was very active in obtaining a traffic light at the Arnold intersection. Margaret Goodhand became principal. Arnold Elementary School became overcrowded, so the Board of Education bought 11 acres from Asbury United Methodist Church to build a new Arnold School. The author has personal experience with the overcrowding. Severna Park Middle School had not been built, so, in the fall of 1965, our 6th grader went to Ft. Meade – an hour on the school bus each way. Our 4th grader remained at the old Arnold School building with teacher, Miss Cooper. Third grade was sent to the Jewish Synagogue School on Spa Road, where our daughter had Miss Alverta Darden, the first Afro-American teacher at Arnold. Our 2nd grader went to class, under Mrs. Duerbeck, in the Education Building of Asbury Church. In 1966 our 1st grader attended Belvedere Elementary. Finally, in November 1967 the “new” Arnold Elementary School opened. School pride was high. The mascot was a cricket, whose characteristics were derived from Jiminy Cricket, Pinocchio’s conscience in a favorite Walt Disney story of the time. The instrumental music teacher, Mr. Rinaldo Massimino, wrote a fight song especially for Arnold. The students love shouting A-R-N-O-L-D at the top of their lungs. A-R-N-O-L-D Elementary, that is our name. A-R-N-O-L-D Elementary, our claim to fame. The Providence Center buildings now occupy the space where there once was a ball field. Every female student the author interviewed fondly remembered a time when the girls made outlines with fallen pine needles of the floor plan of a house. Of course the follow up was that the boys liked to mess it up. One former student showed me the scars on his knuckles from playing marbles at recess. PTA parents were active in fund raising activities. Parent volunteers helped introduce computer concepts, coach a new chess club, and assisted as aides in reading and the library (now the media center). Many things have changed at Arnold Elementary. The current mascot is a terrapin. No one remembers a fight song. Current Principal, Rosemary Biggert, came to Arnold in 2001 and has guided the school on a path of progress. Now there are computers, along with dry erase boards; hot lunches purchased for $2.60; an on-line newsletter; and last winter, students could email questions and get answers from a US Navy wintering-over party at the South Pole. Bright colors abound in the hallway show cases displaying student art projects. 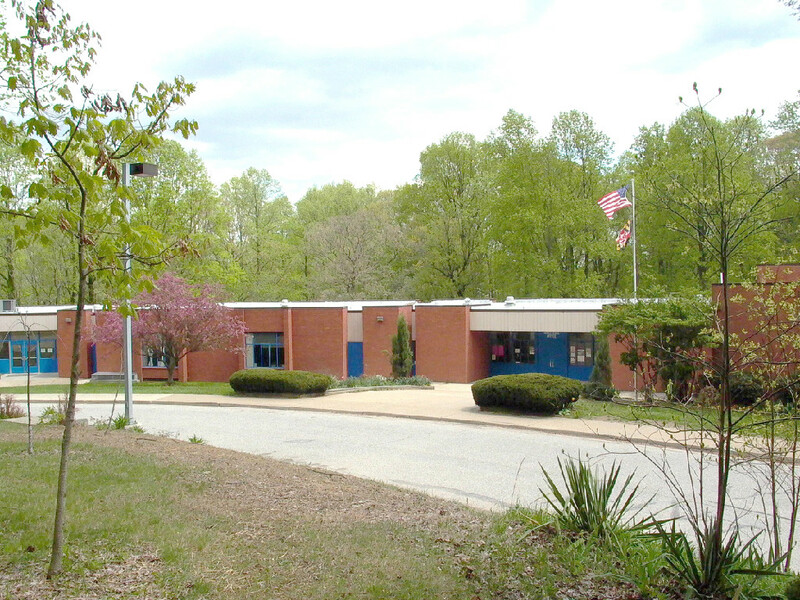 At the present time, Arnold Elementary School is rated very highly by educators as well as parents. The high standing of the school is one of the reasons newcomers want to move to Arnold. Today, the life of the brown shingled building on Church Road has not ended. For a few years it was used by the Board of Education as a regional office building. Now the building serves a new and exciting purpose. After extensive remodeling in 1979, it was reopened as the Arnold Senior Center. Once again the building is a bee hive of activity with classes and entertainments for our senior citizens, many of whom have fond memories of things they did in the same classrooms at an earlier time in their lives.